Malwarebytes Anti-Malware has an excellent reputation, and many consider it to be one of the best security solutions available on the market these days. Part of the success comes from the fact that it is offered as a free and commercial version, and while the free version is limited somewhat -- it does not support real-time protection for instance -- it is often used as a second opinion scanner instead. Today, the first public beta of Malwarebytes Anti-Malware 2.0 was made available, and boy does it introduce changes. The first thing that you will notice right away is that the interface has been changed completely. Malwarebytes Anti-Malware 2.0 has a new interface, and while that is a good thing mostly, it is a bit irritating that some of the buttons -- scan now for instance -- look very similar to ads that you come across on the Internet. Those are not advertisements on the other hand, rest assured. The new interface displays the most important information right on the front page. It tells you if your system is protected, if the database is up to date or outdated, what type of license you have, and whether real-time protection is enabled or not. You can run a scan right from the window, or click on the scan button at the top instead. What you will notice is that Malwarebytes Anti-Rootkit has been integrated into the scanner. It is not enabled by default though, so if you want the program to scan for rootkits as well, select Settings > Detection and Protection, and enable scan for rootkits there. Another tool that has been integrated into the new version of Anti-Malware is Chameleon Driver. It is only available as part of the premium version, and needs to be enabled under Advanced Settings. It has been designed to provide self-protection for the program. The Malicious Website Protection has been improved as well for client systems running Vista SP2 or newer. It offers better performance, options to exclude processes, IP addresses and individual urls. Improvements have also been made to the program's detection and removal technology, including native 64-bit scanning, detection and malware removal. There have been changes to the business side of things as well. The major change here is a switch from a one-time payment model to a subscription model. The program will be offered for $24.95 per year when it launches, instead of a lifetime license that you get for the same amount currently. The company will honor all lifetime licenses. Considering that you can still get one, now may be the time to purchase a license of Anti-Malware Pro to avoid the yearly subscription costs. The new subscription model allows customers to use the software on up to three PCs, which is an improvement over the 1 PC use of the old. You can try the new Anti-Malware 2.0 right now. Download and a test license key are offered on the official forum. The improvements and changes that have been announced improve the software further. The move to a subscription model on the other hand may not be appreciated by all users of the software. The free version has not been mentioned in the announcement. It is however likely that it continues to exist. Martin, thanks for the great article. We will continue to provide free malware detection and removal forever, it is core to our brand. You didn’t pay to get infected, you shouldn’t pay to remove it! MY QUESTION: So are monthly subscriptions about to happen? Why did he write that? Has he heard something? Do you know something? What’s the story? Gregg, Marcin talked about the free version. The paid version (currently known as Anti-Malware Pro) will switch from a “pay once for life” model to a “pay once per year” subscription-based model. I just picked up a number of Pro Lifetime licenses, a couple for $9.95 and some for $14.95. Are these “Lifetime” licenses going to be honored? Or is it going to be a short lifetime? According to the announcement, lifetime licenses are honored. Right, but — and this is directed at @Marcin Kleczynski, too — when will the switch to monthly subscriptions begin? Is it when version 2 pro comes out of beta? Or is there some other schedule? As far as I understood it, once version 2.0 comes out, the switch is being made. I found them at Newegg, one in December and another in January. Marcin said in the announcement that several thousand more lifetime licenses will be made available. Keep your eye on Newegg! But I did not live in US. I can not purchase this. Is there any other way to purchase with discount price ? Great tip Martin, am now the owner of a lifetime license. Thanks! 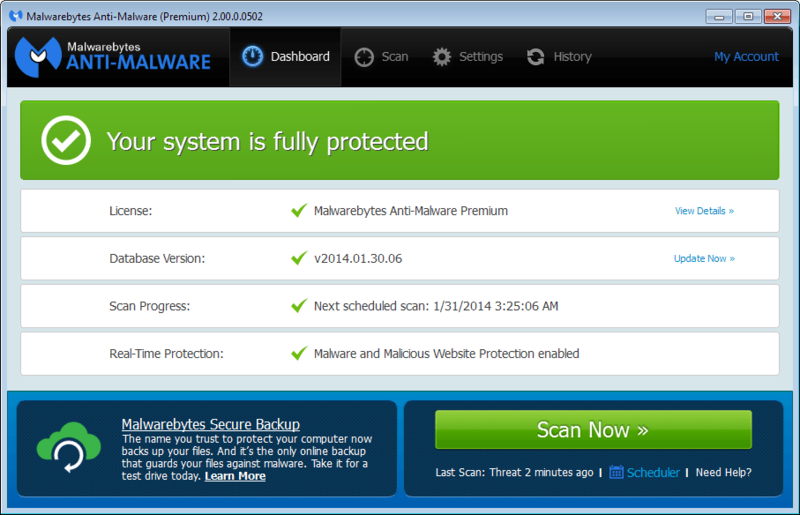 I was waiting for a brand-new change in the Malwarebytes Anti-Malware security software! MBAM IS definitely one of my premier go-to layers of cyber defense when protecting computer systems. I have had the Pro version for years and download the free version for my elderly neighbors who are not quite computer savvy – – yet. Again, Mr. Brinkmann, you know we love you and hope you continue to give us more timely articles in the future. Special Note: Please if any reader can make a donation to the Ghacks.net website – – do it! The funds will insure that the articles will continue because the advice given therein WILL ultimately save us Time and Money pertaining to all things related to the computer and Internet! Is this version 2.0 also a complementary security device or does it replace a regular antivirus? In other words, would it conflict with Avast Free Antivirus or would it help to increase my security? Thank you. It complements an antivirus program. I use it alongside Avast Pro with no problems. The great change that I love, with this new Malwarebytes version, is the ability to exclude IP’s, Domain and system processes because sometimes it blocks online game’s sites while patching for game updates. It’s a great interface and new solid protection. However, you are right Martin,the move to yearly subscription is a bit disappointing. Nevertheless, I still love malwarebytes and maybe they just needed it to improve Malwarebytes as we expected. Okay, I found, in the Malware Bytes forum posting, where the Lifetime license is going way starting with version 2; and that a $24.95/year subscription model will ensue. Mary-Anne already has one. And I’m virtually certain I had a lifetime license in an old company name, but I’ll be darned if I can put my hands, right now, on the documentation. Doesn’t matter: I just bought another one, this time in my personal name. I’ll figure out the other license later. When I do, that’ll be the one that goes on the notebook that’s about to become our PCTV system. Can a lifetime license for MBAM be transferred from one computer to another, say from an old XP machine to a new one running Windows 7 or 8 (or 9, next year)? Yes, I see that it’s $19.95 from Newegg, whereas it’s $29.95 from Malware Bytes. It’s not uncommon for the original maker of a product to only sell it for full suggested retail, and for its dealers to discount. If the original maker also discounted, then it would be competing with its own resellers; and so most won’t do it (and those that do end-up losing their resellers). Some original makers, though, when a buyer asks, privately, if they’ll price-match a dealer’s/reseller’s discounted price, will do it; but they usually won’t advertise it. Some dealers/resellers even don’t like that, though, and so many original makers won’t even budge from full retail. It all just depends on the maker. Currently, the Malwarebytes Online Store is selling lifetime single-computer MBAM Pro licenses for $14.95 — https://store.malwarebytes.org/342/purl-arrrlp?&affiliate=25448 . Thanks for the heads up, AJ! The Lifetime license will be upgraded to V2 in March, or whenever it is released. To try V2 now, you need a different license key, as it is in beta. While version 2 beta 1 locked my Win7 x64 Home PC and required a hard power off the few times I ran it, version 2 beta 2 has run flawlessly for me so far. I’m very pleased with beta 2. It appears not to conflict with the latest Microsoft Security Essentials Pre-release. I suggest reviewing the beta 2 forum before installing.